Rich Marovich was hired to lead Putah Creek's restoration efforts, but locals say he's healed much more than the creek. Rich Marovich’s boots crunch along the gravel and dirt path that runs next to Putah Creek in Winters Putah Creek Nature Park. A warm sun shines low in the late fall afternoon, gleaming through the iron beams of the old Southern Pacific Railroad bridge. Shielding his eyes with one hand, he looks out at the stream and grins. “I don’t get to see my success very often,” he murmurs. On the edge of the city of Winters, off Interstate 505, nestled into a patchwork of walnut orchards and fertile fields, grasses grow in neat rows. Thin trunks of two-year-old alders shoot up in clumps inches from the water, eye level with Marovich. Despite the drought, water winds through the creek bed, its narrow, even width neatly carved into loose bends. It disappears down a mile of planted landscape, past a flood plain where earth-moving machines will realign the creek through the last section of the park. Marovich is Putah Creek’s streamkeeper, hired to guide the restoration of the creek; the position was created as part of the accord signed by the water agencies and the Putah Creek Council. 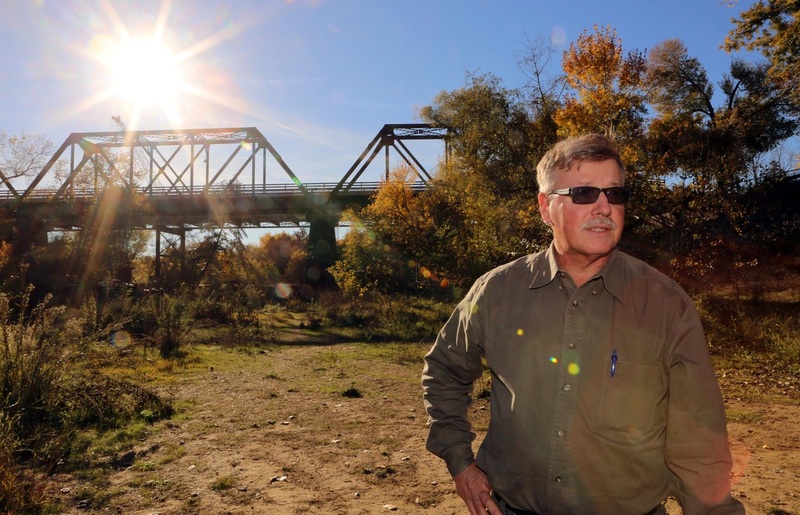 Rich Marovich oversaw sweeping changes at Winters Putah Creek Nature Park. Five years ago, Marovich would be treading 15 feet of stagnant water. Sixty feet wide, any meaningful creek flow paused as it filled a massive hole leftover from a gravel mining operation that helped build Monticello Dam. The site used to house Winters’ sewage aeration plant: four ponds that had been used to treated the town’s waste had been covered over. Steep banks cut steeply down from the road that runs on the south side of the creek, covered in a thicket of tough, spiny Himalayan blackberry vines.. A few short dirt paths ran along the upper banks, but only the most reckless adventurers — teenagers — could reach the water. The kids dropped into the water on an old rope swing and tossed back beers on a slab of concrete called “Little Rock,” the remains of a long-defunct percolation dam. It was easy to mistake towering invasive eucalyptus trees for a healthy riparian forest, the weedy undergrowth as wild nature. To many people, the creek looked lush and healthy. "There's beauty in the most degraded of conditions," Marovich says. Marovich arrived at Putah Creek a decade and a half ago from the state’s Environmental Protection Agency looking to get street cred: boots on the ground, hands in the dirt, canoes in the water. When landowner Dennis Kilkenny found out about Marovich, he was furious. Marovich had been hired by the Lower Putah Creek Coordinating Committee (LPCCC). Established during early negotiations, the LPCCC directs the restoration work. Five of its members were from Yolo County, five from Solano, among them representatives from the Putah Creek Council, UC Davis, the water agencies and several Solano County cities. Seventy-two percent of land that borders Putah Creek is privately owned, so 72 percent of the restoration would take place on private land. But when Marovich was hired, the committee roster lacked even a single landowner. Kilkenny and fellow landowner John Pickerel, who owns The Buckhorn Steakhouse in Winters, stormed into the first LPCCC meeting, prepared to raise hell. The Solano County Water Agency had given landowners enough grief, suing every single one over water diversions in the early 1990s. Now, the agency had hired some guy out of Sacramento, and the landowners did not trust his intentions. “We said, 'He’s not coming on my property, he’s not coming on anybody’s property. We’re going to go to war,' " Kilkenny remembers. Committee members looked around at each other and back at Kilkenny. Pickerel and Kilkenny were the first landowners to come around to Marovich, along with John and Erin Hasbrook. 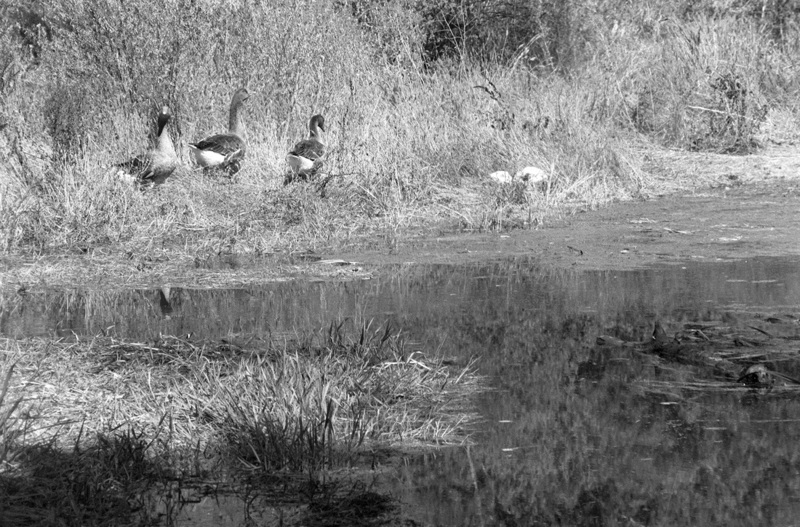 While he worked to gain the landowners' trust, Marovich surveyed the creek: He measured the temperatures of the water in the wide pools and the fast-flowing stretches, pinpointed the banks that need to be stabilized and mapped the spread of invasive species like the arundo, which grew so thick in one of Putah Creek’s tributaries that it entirely rerouted the channel. The position was intended to be an introductory post for budding ecologists. But Marovich never left. In the past 14 years, he has raised more than $12 million for the creek. Marovich calls Putah Creek his sanctuary, though he also jokes it’s to blame for his hair loss. He adds, more seriously, that he doesn’t know how much more hair he has left to lose. There’s a timeline on his work with the creek. In order to court the landowners -- he couldn't do much without them -- Marovich pulled some strings, fast-tracking permits for their own projects near the creek. This built the streamkeeper some goodwill among the close-knit community of farmers and landowners, Kilkenny said. Over 5:30 a.m. cups of coffee at the Putah Creek Café in Winters, they spread the word that he was turning out to be a reasonable guy. By 2006, Marovich had working agreements with 49 landowners. That trust was built through effort. When landowners were still having trouble with trespassing, in large part because there wasn’t really anywhere close for the public to enjoy the creek. Marovich and Wolk convened a town hall of farmers, community members and local leaders to decide on a path forward for Putah Creek restoration. Marovich presented some details on the state of the creek, gave suggestions for a few possible projects and then turned over the discussion to the attendees. “It’s not like we were clueless about what needed to be done, but it was really a way of suspending judgment and hearing from the community, ‘What are your priorities?’ It was a shared vision rather than a vision shared,” he said. The landowners voiced their concerns about public intrusion on their land. Winters residents asked for some kind of local access. Both groups agreed: Winters Putah Creek Nature Park — the same spot where the first Putah Creek Council cleanup took place way back in ‘88 — was their No. 1 priority. Rachel Carson, who authored "Silent Spring," pioneered the idea that if you get people who live on their land to care about their land, they will act. This idea drove the Putah Creek Council's lawsuit — local people taking note of local environment degradation — and Winters Putah Creek Park would continue that line of thinking. By creating a public area for people to enjoy the waterway, more kids would grow up on the creek, and the public would have a clear investment in keeping it clean and healthy. That's good for the people and good for the fish. Marovich had promised that the park in Winters would be his priority. But it wasn’t going to be an easy task. For one of his very first ventures as the newly hired streamkeeper, Marovich had canoed down the creek, from the Solano Diversion Dam to the mouth of the Yolo Bypass. He remembered that stretch of creek under the railroad bridge, its remarkable degradation. The foundations of the percolation dam distorted water flow. Gravel operations had removed thousands of pounds of creek bed, leaving gaping holes that stalled water flow. Invasive species blanketed the banks, which shot vertically up from the water instead of meandering gradually up and outwards, like the creek’s native flood plains. In 2002 and 2006, California voters passed two Safe Drinking Water, Water Quality and Supply, Flood Control, River and Coastal Protection Bond acts, mouthfuls of law that preceded this year’s Proposition 1. The first established the California River Parkways Act in 2004, and the second provided $61 million to the California Natural Resource Agency to fund it. The money has been used up and down the length of the state, from Yuba City to Los Angeles, to restore degraded channels and enhance public access. Marovich wrote grants on nights and weekends, earning a mile-long stretch from the Car Bridge to Highway 505 more than $3 million dollars — a whopping 5 percent of the total parkway funds. His applications spelled out exactly what needed to happen. Invasive plants — including hundred-year-old towering and beloved eucalyptus — needed to be uprooted and replaced with natives. The banks needed leveling, paths for recreation laid, the creek’s gravel bed restored for spawning habitat. Most difficult: The creek needed to be filled in and narrowed, then reshaped to align with the mathematical models of Luna Leopold, a 1900s hydrologist who discovered that all natural waterways follow certain predictable patterns. “All the life in the creek channel depends on these mathematical formulas. It’s the foundation of life,” Marovich said. Restoring the natural meander of the creek would give fish and native fauna a real shot of fighting back against alien competitors. The percolation dam was removed in 2008, under some protest from locals who had used it as teenagers. In 2011, Marovich and a consulting firm began reconciliation efforts: reshaping the creek into its natural pattern of riffles and bends. First, the creek had to be dewatered. Pipes were laid in the creek and welded together to create two mile-long diversions for water up creek. Then, temporary dams were erected, and any remaining fish rescued from the isolated portion of the creek. The project took a year and a million dollars, but Marovich is confident his work will be permanent. “When we started to understand that rivers follow natural patterns, we could also understand that (our work) would not unravel. We could count on physics to do the rest,” Marovich said. Now, even in winter, residents jog down to the creek for an early-morning run, breath frosty, feet pounding along the dirt and gravel. “Once the paved trail was constructed, it was immediate that you saw a real different cross-section of the community: children with bikes and grandparents and strollers,” said Carol Sciana, Winters’ environmental services manager. Schoolchildren take field trips to the park and play "I Spy" with otters and minks and beavers. An older couple shows up to pick up trash every morning; a couple of cyclists stop for the view. Just as the people have mended the creek, the creek has mended the people. “You could almost make a movie out of it, how hostile it was at the beginning, to where it is now,” Kilkenny said. With everyone sitting around the same table, Solano and Yolo parties were forced to talk. With the money already on the table, guaranteed by the terms of the settlement, there hasn’t been anything to fight over. But it’s more than that: Solano County Water Agency General Manager David Okita hasn’t just adhered to the settlement; he is universally praised among those involved in the restoration. In August 2008, new landowners diverted so much of the creek that the accord requirements were violated five times in four weeks — more violations than in the past eight years. Initially, SCWA was going to sue, but Marovich organized a meeting between Okita and the landowners. They set up a “gentlemen’s agreement” to police themselves, and they’ve stuck to it. “I can’t say enough about how David Okita and SCWA have bent over trying to let these guys get along,” Kilkenny said. Libby Earthman, the Putah Creek Council’s director from 2009 to 2014, also credits Okita with saving the Council when grant money disappeared during the recession. For those actions, and others, he was awarded the City of Davis’s Environmental Award in 2009. “It really has been a marvel ... how they can work together and how it’s all come together for the common good,” Kilkenny said, of Okita, Marovich and the committee. Back in Winters, there’s still work to do: plant more native species, extend the path all the way down to the highway, flatten out more of the bank. But Marovich no longer sees the creek as a project that will take a century or three to finish. He steps gingerly off the beaten gravel path, walks a couple of steps over to a stand of young alders, their thin trunks bunched gamely together in groups of three and four. In 10 years, when their trunks have thickened, they will reach their limbs out over the water and touch the mirror of trees on the other side. Their ridged leaves will shade and cool the water below, and they will join with oaks and willows and cottonwoods to create the first riparian forest the creek has seen in 150 years. Editor's note: This chapter differs slightly from the version published in The Davis Enterprise on December 11, 2014.